If your IT team is tired of the time-consuming management involved with using a three-tier architecture with disaggregated servers, storage, and SAN to run applications, you may be considering upgrading to an integrated solution to streamline your business. 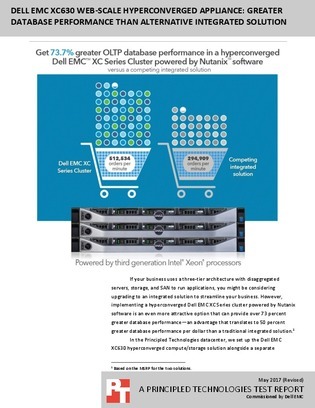 With hyperconverged infrastructure in particular, you can potentially gain 73% better database performance in addition to simpler cluster management. This Principled Technologies report tests one HCI, Dell EMC XC630 Hyperconverged, against an alternative integrated solution on database workloads. Download now for the results, a detailed system configuration and pricing for the two.